Mountain bikes are constantly evolving. Every year they are getting slacker geometry, more travel, better suspension, and crazier gear combinations. However, not everyone needs or wants a mountain bike that has suspension, some riders just want something simple and fun to ride. The 2018 Kona Unit X Bike is a Reynolds 520 steel framed hardtail mountain bike that doesn't have any suspension. It comes with 27.5-plus wheels and tires which provide excellent grip and damping while on the trail. 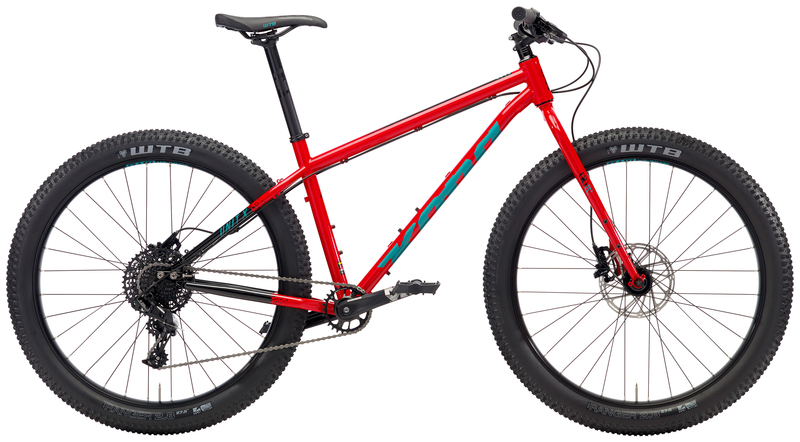 It is the perfect bike for riding on the trail or taking on a bikepacking trip in the backcountry. The Unit X comes with a SRAM NX 1x11 drivetrain that includes the crankarms, rear derailleur, and shifter. SRAM's NX drivetrain provides an 11-speed cassette with an 11-42 gear range that is perfect for tackling those tough climbs but also provides gearing perfect for the flats. The SRAM Level T hydraulic disc brakes provide ample stopping power for those long descents and they are paired with SRAM Centerline rotors. It features WTB Scraper i40 TCS rims laced to Formula hubs and are perfectly paired with WTB Ranger TCS tires so you can set everything up tubeless for a smoother ride and better traction. While it doesn't come with any crazy Fox suspension, it does have a Kona Plus fork that is strong and durable. If you're looking for a simple mountain bike that is fun to ride on the trails, then you'll love the 2018 Kona Unit X. Rigid suspension because who needs suspension, right? 152-160 cm 5'2" - 5'7"
157-170 cm 5'6" - 5'10"
168-178 cm 5'9" - 6'0"
175-183 cm 5'11" - 6'2"
180-188 cm 6'1" - 6'5"
Solid bike and could not beat Jenson’s price. Bought this to ride local state park and fire roads with my son. Jensons service was great. Everything arrived well packaged and protected. This is the 2nd bike I've purchased from Jenson. Their service is awesome and this bike came out of the box ready to ride. I wanted a bigger tire bike, but also one that is versatile. What I used to ride on my old Superlight , I now ride on this, full rigid. I also plan on bikepacking a lot on this. And with the sliding dropouts, you can single speed it. I love this bike, it was a great value! Is the Kona Unit X dropper-friendly? 5 foot 9 guy what size bike ? BEST ANSWER: I'm the sme height with a 32" inseam and I went with Medium. I like the reach on that size and the overall handling. I've heard that folks using it for bikepacking went for the Large for a bigger triangle to accommodate bigger frame bags but I like the grometry so much on the M that is what I went with!